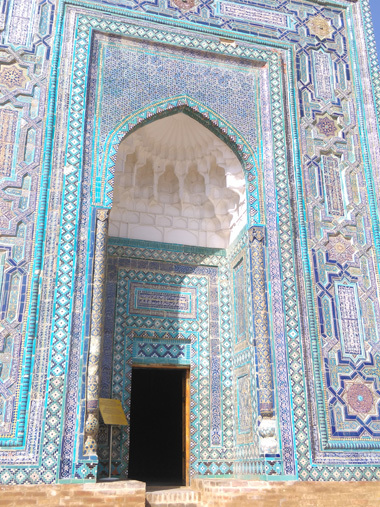 This is an entire day to explore Samarkand. It’s about 10 AM when we’ve got our breakfast and are ready to leave the hotel and explore Samarkand. The views of Bibikhanum Mosque from the hotel are wonderful at daylight. Our plan for today is to start by the further areas, so we’re going to the area known as Afrosiab, where we’re going to visit necropolis Shah-i-Zinda. We take Tashkent Avenue in the opposite direction where Registan is. There is a lot of live in the avenue and in the market, as we pass by its entrance, in contrast of what the look we got from these places last night. We don’t stop, as these near places are plan for be visited tomorrow, and we reach the end of the avenue in no time. There, we have a look of mosque Khazret Khizr across the road, but the bridge connecting to it is closed and the guards in the door are giving us indications to the necropolis: we must go to the road in a lower level and follow it. We follow that indications and, after passing by a modern cemetery, we reach the entrance to Shah-i-Zinda which, again, is through an iwan, that sort of massive door which seems to have all the ancient buildings in this country. We pay 10000 soms each for our admission tickets and 3000 soms more for the photo permission and take the staircase up to reach a narrow street with beautiful blue walls. In the map below, which can be expanded to read the indications, the entrance is at the right. We’re at the end of that long passway, which represents the staircase, between the pink squares. Every door here leads to a mausoleum, which use to be a small room with a tiny window and with walls whether covered by blue tiling or with no decoration, all white, with one or more tombs on the floor. There are a lot of people here today, but they’re looking like locals or neighbors. We can see women praying in most of the mausoleums and offerings in most of the tombs, like bank notes. This street gets an opened space at right before ending in some wooden doors breaking the blue patterns in the walls. The most crowded mausoleum and the one with more praying is Qusam ibn Abbos. It is the biggest too, with a few rooms and even a mosque. We could say is the most beautiful too. After the door that is the exit of this street there is a place with stairs to the modern cemetery, so we turn around and walk through that street again, but for leaving it this time. Besides the stairs we climb at the beginning there is a space with wonderful views to Bibikhanum Mosque. We explore the places close to the entrance we missed before leaving the complex. Once back in the streets, Eva uses a public toilet, for which we pay 1000 soms. It’s 11:30 AM and we want to take a taxi to Ulugbek Observatory. We’re not managing to get an official one, so we get to the guy that stop for us and get the deal of 5000 soms for the short ride. Admission tickets for the observatory are 22000 soms each and we think it is expensive for what we see: a basic museum and the remains of the biggest sextant in the world, which was built by Ulugbek here using an entire building. This price is just two euros something, but its twice the price of the necropolis and that makes a ridiculous comparison. We leave the top of this hill by taking the stairs down to the level where the statue of the astronomer Ulugbek is. This place seems to be one of the favorites for grooms and brides for pictures as we can see even three couples in a photo session here. The next taxi we take is finally to Registan. This time it is an official one and it takes us through narrow and damaged streets as a shortcut to the most popular place in this country by 10000 soms. It’s 12:45 PM when we’re in front of this wonder that is Registan, the most iconic place in the whole country. We didn’t know if we were going to get our lunch before or after this visit, but now we can see it there is no doubt, and no hunger either. There is a view point in the street as the complex is closed for the ones that are not paying for it. We walk down by the right side to the ticket box, where we pay 30000 soms each and get into the square to look around amazed. We start by this left side and get into the first madrasa, Sher-Dor. The highlights here are the tigers in its iwan, the internal courtyard and the two blue domes. The next is madrasa Tillya Kari, the one in the center of all Registan pictures. The highlights here are the courtyard with trees and the golden interior of the mosque. We end the visit with the madrasa Ulugbek. This way, we’ve visited the three madrasas from newer to older. The highlights here are the gardened courtyard and the interior rooms, with painted wooden columns. We leave the complex because we’re going to lunch. The street, just across Registan side, is full of restaurants and we choose one that is offering plov by 9000 soms. The price is finally twice, as they say the offer is for small portions. This is the worst plov we eat is served with boiled chicked pieces looking like leftovers as meat, instead of the usual pieces of beef or lamb. We pay 40000 soms for the lunch. It’s not 3 PM yet, so we decide to go on with our visits and walking this same street down to the mausoleums area. 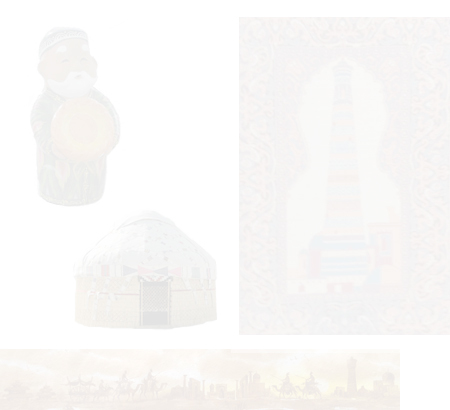 We soon reach Amur Temir Park where the domes over the trees are showing us where the monuments are. We first go to mausoleum of Rukhabad. 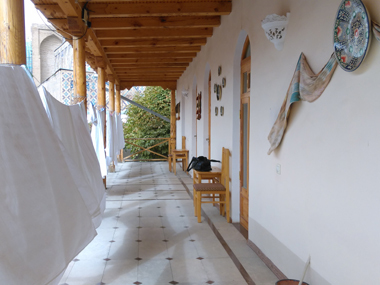 Then, we walk across a courtyard with a yurt to reach the wonderful Guri Amir Mausoleum. The admission ticket is 22000 soms here. 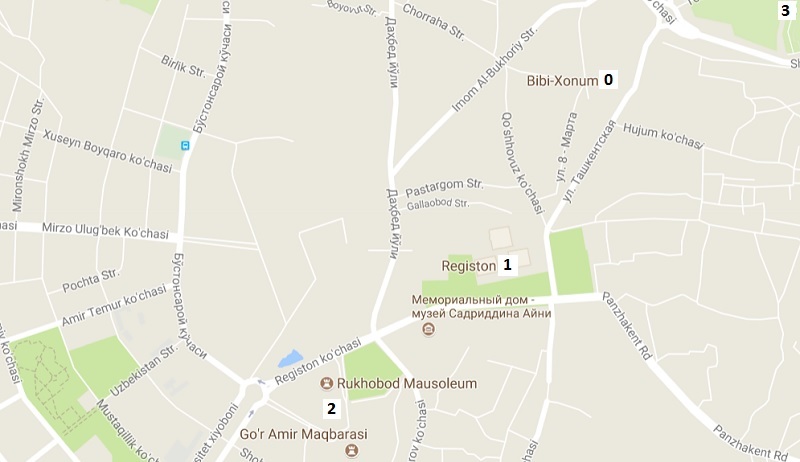 We finally need to ask to reach Ak Saray Mausoleum. With this we’ve done more visits that we thought for today and we’ve only left the mosque besides the hotel for tomorrow, so we walk back to Registan. There, we make some shopping in a modern supermarket we saw before. Then, we walk back to the hotel by Tashkent Avenue.